Driveway repair is a crucial part of home maintenance. We all rush to fix a dripping tap because the thought of those dollars dripping away drives us crazy. But fixing a cracked or faded driveway can save you thousands of dollars in costly replacement, yet few of us rush to look after it! It's critical to keep up with annual maintenance if you want to preserve the life of your asphalt while protecting your home's curb appeal. Treated properly, an asphalt driveway can last up to 30 years without needing replacement. So where do you begin? 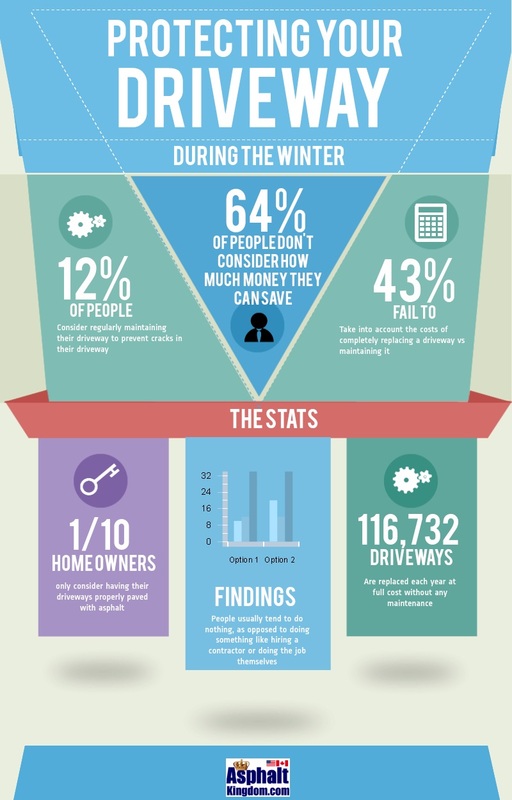 Do You Need to Repair Your Driveway? What is Asphalt, Anyway? Why Does Asphalt Crack? When Should You Seal Your Driveway? Should Sand Be Mixed With the Sealer? How Long Does it Take for the Sealant to Cure? When Should You Choose Commercial-Grade Sealer? Do You Need to Repair Your Driveway? Here's a free, fast and easy test you can try at home: pour some water on a well-trafficked part of your blacktop driveway and watch what happens. If the water beads on the surface, your asphalt is in good shape. If it doesn't, though, you have problems you should address as soon as possible. If water is seeping into the asphalt, it's causing damage. In warm seasons, it will erode the pavement – and the foundation – causing it to crack. As the weather gets colder, a freeze-and-thaw cycle will begin, and the expansion and contraction will increase the size of the cracks. As the foundation becomes compromised, you've gone from looking at spending a few hundred dollars repairing your driveway, to thousands of dollars replacing it. Aside from the water test, look for obvious signs of trouble: cracks in the driveway can allow vegetation to spring up, further eroding the foundation. 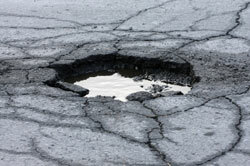 Potholes will eventually form if the cracks aren't treated, and they're another sign of trouble. And a badly faded sealcoat surface where all the stone aggregate is clearing showing is another sign that it is time to sealcoat. Heat, grease, gas, oil spills and salt stains will all work to eat away at your driveway: a fresh coat of sealer can protect your driveway for years. Asphalt is a tarlike material found in petroleum deposits. When heated and mixed with crushed rock and other substances, it becomes a somewhat smooth texture that can support even the heaviest of vehicles. It’s commonly used on public roads, as well as on the driveways of many private residences. Asphalt is similar in chemical composition to motor oil and gasoline. If these items get spilled on the surface, they bind with it and staining will occur. Basically, sealing is the only way to ensure that your drive looks as good as it can for as long as it can. Driveways that are not sealed develop cracks faster and need to be replaced. So, sealing is a money-saving choice. When Should You Seal Your Driveway? For brand new driveways and parking lots, it is important to wait at least 90 days for the material to be fully cured and hardened. Once the 90 days has passed, you should seal as soon as possible. After the initial coating, you should seal whenever you do any crack repair or pothole filling. 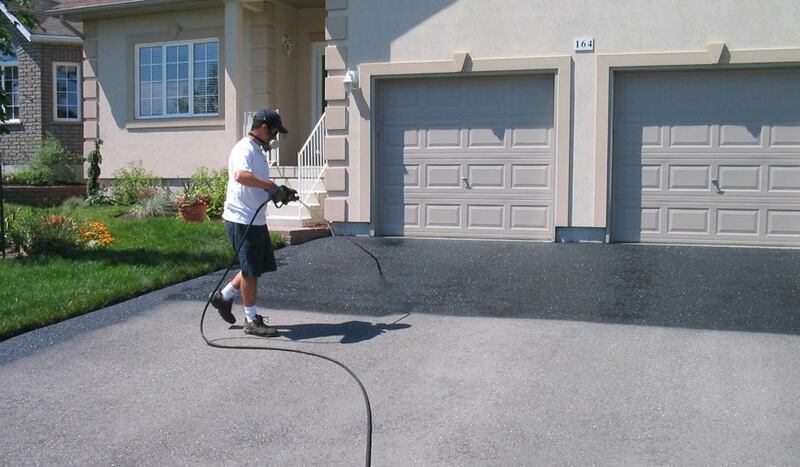 Higher quality asphalt driveway sealer will last for 3-5 years before a new coat is needed, depending on the amount of traffic the area receives and the amount of UV damage it gets. Low quality sealants may need to be replaced more often. The low quality products are cheaper, but there is a specific disadvantage to low quality products that they need to be replaced more often. The layers will start to crack, flake and peel much sooner than the better quality products. The higher quality sealants are definitely worth the money. As far as the time of year to seal, the summer months are best. In general, the temperature must be above 50 degrees for the sealants to cure properly. Should Sand Be Mixed With the Sealer? 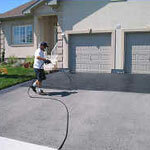 Most professionals recommend an asphalt driveway sealer that has sand mixed in with it. The sand improves durability and improves traction. How Long Does it Take for the Sealant to Cure? The cure time depends on the kind of sealcoating you decide to use. Most professionals recommend waiting at least 8 hours before driving your car on the coated surface. In the cooler months, it may be necessary to wait for 36 hours with our sealer; with hardware-store amateur sealer, drying time is between 36 and 72 hours. When Should You Choose Commercial-Grade Sealer? Commercial grade sealants are definitely required for airports runways and they're also needed in parking lots with lots of traffic. If it's good enough for the mall, you can bet that a commercial-grade asphalt driveway sealant will do an excellent job in your driveway, too! Sweep or pressure wash to remove all grit and debris. A wire brush is also a great tool for removing debris. If you do pressure-wash, make sure to allow time for your driveway to dry before crackfilling. Clear all weeds, sand and loose gravel from the edges and any cracks or holes. If you don't kill the weeds in cracks, they'll sprout up again causing more damage! Use vinegar to kill weeds effectively and in an eco-friendly way. 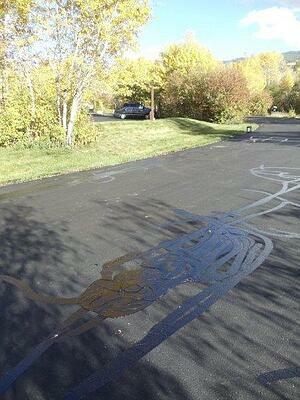 Remove All Fuel Stains from your blacktop with a degreaser. Sealer won't sit well on top of oil or gas. Do not skip this step! Asphalt sealcoat can repel the elements but it needs to be applied on a sound surface, and that means filling in cracks and holes. It's a simple process. Rubberized crack filler (for cracks more than half an inch wide) with a crack fill melter to melt and apply the crackseal. If you're using cold liquid crackfiller, shake it to ensure it is thoroughly mixed, and then fill the crack just flush with the top of the asphalt surface. You don't want to overlap too much or the seals will show through the sealer. If you are using the hot rubberized crackfiller, heat your melter or kettle and insert the brick of crackfiller. If you are using Asphalt Kingdom's Crack Fill, you can use a direct-fire kettle or an oil-jacketed melter; cheaper crackfill can only be used in an oil-jacketed machine. Once the product is melted, apply it at a walking pace over all your cracks ½ inch wide or smaller. * NOTE! If the crack is wider than ½ inch or if it is deep, you should first top up the crack with a mix of gravel and sand, packed firmly in the crack. Fill to within ½ inch of the asphalt surface, and then fill the rest with hot pour crackfiller. Allow time to cure for a few hours before sealing. You should have already cleaned the edges of the pothole during your cleaning session in step one, but if not, make sure you do that. Then cut open the bag of asphalt patch and pour it into the pothole. Our Cold Patch Asphalt repair product will fill a hole 1 inch deep by four feet in diameter. First apply and force it in all the voids, making sure it is tightly packed. Then add more so it’s slightly mounded above the surface of the blacktop. Now use that piece of plywood, oiled side down, to cover the area. Drive over the wood with your car to firmly tamp down the crack filler / asphalt patch. See? No fancy vibrating plate. Asphalt Kingdom’s AK10 gallon applicator is the best hot pour crack filling system on the market, capable of filling 25 feet of cracks in just 15 seconds! See how fast you can fill in this video. The next step in the process is to seal the patched and filled surface, providing a layer of protection from the elements and greatly increasing your home's curb appeal. First, tape off the driveway, sidewalk, house walls, or anything else that borders your driveway that you do not want to get sealer on. If you have a friend or a child who can help, you can save time by having them move with a stiff piece of cardboard, holding it against things you are trying to protect while sealcoating. Next, stir the asphalt sealer until the consistency resembles a thick soup. If you are using an Asphalt Sprayer to spray the driveway, begin by trimming the driveway using a finer spray tip. Once all the edges are done, switch to a wider tip, and begin spraying from the right to the left. If you are spraying by hand, pour a one foot wide puddle of sealer across the top of the driveway. Use your asphalt squeegee to spread the sealer in a push-and-pull motion, working until the sealcoat is between three to four feet wide, evenly dispersed. When that is done, repeat the process, moving down the driveway. If you are using sand, now is the time to sprinkle sand over the driveway in a light and even coating. This improves traction. Important Tip: use two thin coats instead of one thick coat, allowing the first coat to dry for several hours before applying the second one. Tape off the area with caution tape and allow to dry for at least four hours before you walk on it and at least 8 hours before you drive on it; overnight is best if that is possible in your situation. After all your hard work, you'll want to maintain your driveway going forward. 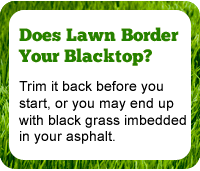 Watch for hairline cracks forming: these can be addressed with sealer if you catch them early enough. Inspect your pavement for puddling after a rainstorm. These depression are the most vulnerable to damage as water sits and possibly freezes. Top up any depressions with cold patch. Tamp it down with oiled plywood. Allow it to cure, then sealcoat the driveway to seal it in. Keep an eye out for weeds growing out of cracks in the asphalt surface. These are a sign that your cracks need to be cleaned and filled to prevent damage going forward.